This will get your week off to an inspirational start. If it wasn’t for Vickie Dryer, a veterinary technician in St. Cloud, a Chihuahua mix puppy born without functioning front legs would have been euthanized. The vet tech at Osceola County Animal Control stopped the request to put down the then-2-week-old puppy and decided to help rehab him. While this little guy will never walk, stand or run like other pups, he doesn’t let his let his lack of front limbs stop him from enjoying life. “His personality is wonderfully sweet, very outgoing. He’s brave, just playful. He’s a normal puppy,” Dryer told the station. Staff at the Osceola County Animal Control was so inspired by the Chihuahua that they named him after Olympian Oscar Pistorius, the South African double-amputee track star who competed in the London Olympics. Best of all, Oscar now has a forever home. A staff member who can take care of all of Oscar’s special needs fell in love with the pup and adopted him. Who could resist this little angel? Watch the video from Fox 35 out of Orlando. Source: Vetstreet and Fox 35/Orlando. In Support of the Local Independent Retailer. The Downtown Sarasota Farmer’s Market was packed with shoppers and their dogs this past Saturday morning. Locally grown colorful produce, plants and plenty of food options. As usual, the big red double decker bus that is Java Dawg Coffee was packed with folks wanting a good cup of Joe Dawg. Foot traffic on Main Street was up, as people and their dogs shopped the boutiques, and dined at the cafes, including our favorite, Cafe Americano. This Labor Day has us thinking about, and appreciating those hardworking independent business owners across Florida. The one constant that we are witnessing now more than ever is how these businesses are supporting their communities by bringing in items that are created and produced by local artisans. 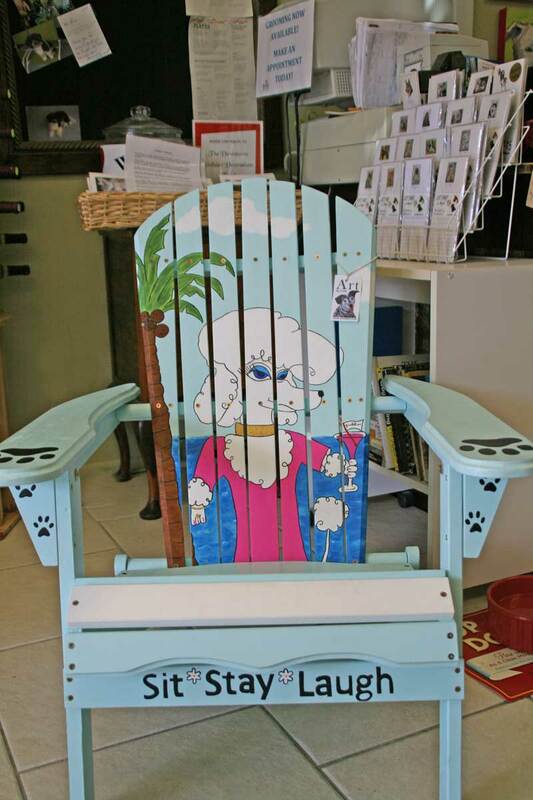 At Wet Noses Dog Boutique on Main Street, we discovered one-of-a-kind, beautifully-painted adirondack chairs. For an unbelievably reasonable price (which includes the chair), your dog’s portrait is painted with the theme of your choice. At Bella by the Sea on Anna Maria Island’s Pine Avenue, fresh cut flowers in containers (for the picking) greet shoppers outside. Guys and dogs can take a load off, grab a refreshing cold beverage, and enjoy the scenery on the breezy front porch, while the ladies take in the delights of what’s inside. (Gentlemen, this is not a bad way to spend an afternoon). Take a stroll down to Emerson’s, and check out the world-renowned artist’s brand of quirky humor on tee-shirts, martini glasses and notecards. Emerson could have chosen any place in the world to settle down and set up shop. He chose Anna Maria Island with good reason. Quaint and vibrant Pine Avenue has been named the Greenest Little Main Street in America by the Walkable and Livable Communities Institute. Available at Gone to the Dogs, St. Pete Beach. 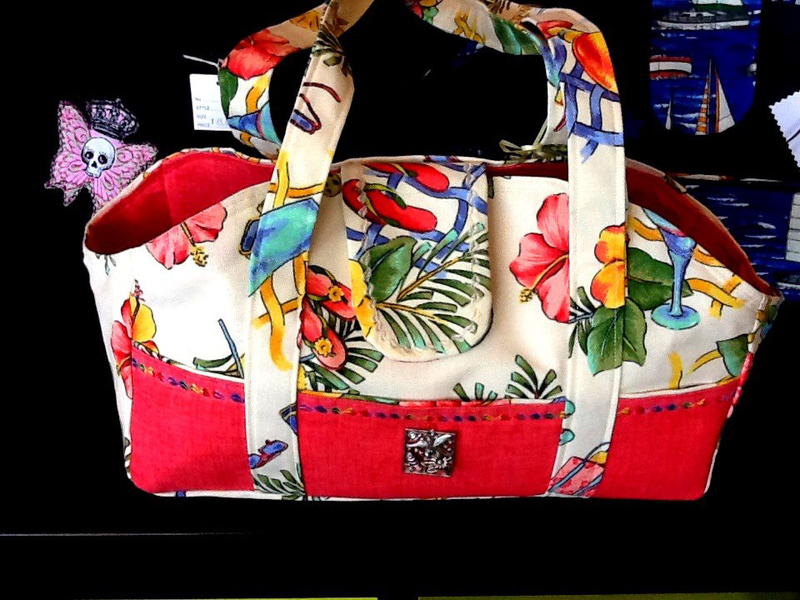 On St. Pete Beach’s historic Corey Avenue, Gone to the Dogs has an artistic array of locally created and produced items, including colorful bags by Clara. New designs are always coming in. The proprietors of Groovy Cats & Dogs in Tampa have worked hard to stock their store with items that are not only locally produced but sustainable too, like dog-themed artwork and decorative accessories for the home. In Dog We Trust is a cool new line of locally-designed bandanas and tee-shirts. Right now, they are exclusively available at Fluffy Puppies in Clearwater, a big supporter of local artists. The Doggie Door on Park Avenue in Winter Park is another big supporter of local artists, and carries the PawPalettes line of notecards, a Florida company. Pawsitively Posh Pooch has become a destination for dog lovers looking for couture doggie clothes. One line (created by a Florida-based artist) has become internationally-known for its unique designs and use of vintage material and accessories. Think: Coco Chanel. “Dress shabbily and they’ll remember the dress. Dress impeccably and they’ll remember the dog.” (With apologies to Ms. Chanel and Bella by the Sea). Another constant that each of these retailers has in common is their support of local shelters and rescue groups. Like the beautiful Cat Room at Pet Food Warehouse, built out specifically to showcase adoptables from Pet Pal Animal Shelter. Or the fundraising events held regularly at Dog-Mania & Cats in Dade City and The Green K9 in Mount Dora. Time and again, these independent business owners have graciously donated their product, services and money to benefit local animal advocacy programs. Stats to Ponder: Did you know that for every $100 spent in locally owned independent stores, $68 returns to the community? That same dollar amount spent in a national big box chain store returns only $43 to the community. Spend that same amount ($100) online, and nothing is returned to the community. The New Barker dog magazine would like to tip our hats to the dedicated Local Independent Business Owner. From the retailer to the restaurateur; the groomer to the trainer; the hotelier to the owners of dog day care centers; the veterinarians, artists and photographers: thank you for your own dedication and support of the local economy. Shopping local benefits each of our communities in more ways than one. Author Anna CookePosted on September 3, 2012 September 3, 2012 Categories UncategorizedTags Anna Maria Island, Anna Maria Island Dog, Dade City, Dade City Dog, Dog, Dog Magazine, Dogs, Florida, Florida dog, Florida Dog Magazine, Florida's top dog lifestyle magazine., fun with dogs., life with dogs, lifestyle, Sarasota, Sarasota Dog, St. Pete Beach, St. Petersburg, The New Barker, The New Barker dog magazine., Winter Park, Winter Park Dog1 Comment on In Support of the Local Independent Retailer. When the Unthinkable Happens, These Dogs and Handlers Spring Into Action. Two National Disaster Search Dog Foundation Teams out of Florida have been placed on standby as a result of Hurricane Isaac. Julie Padelford-Jansen and her dog Lilly-Belle, based out of Miami, and Marshia Hall and her dogs Lilah and Trapper, out of Tampa. National Disaster Search Dog Foundation Team, Marshia and Trapper. 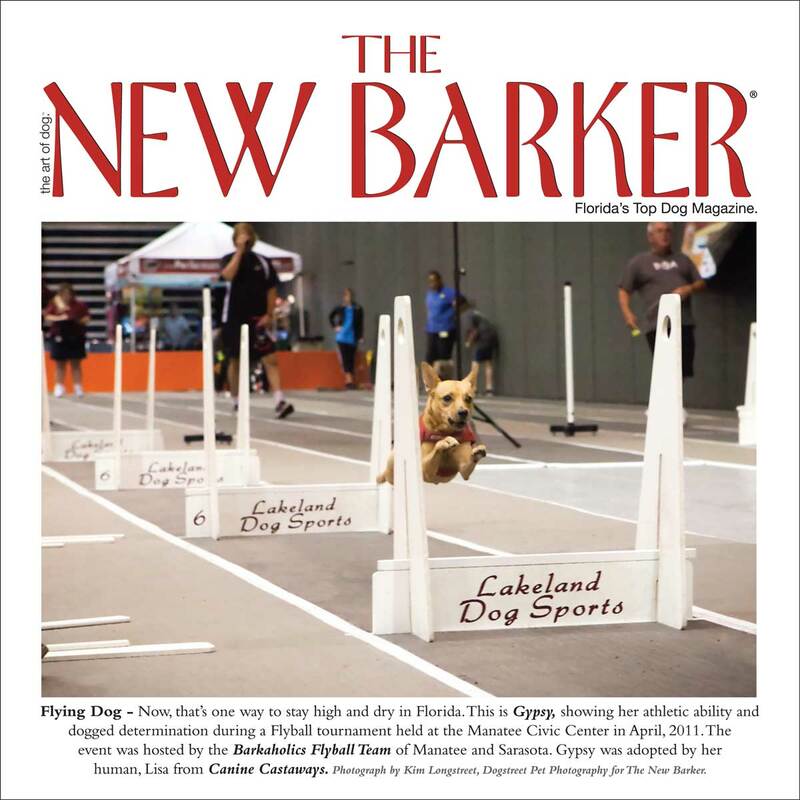 Marshia and Trapper were featured in the summer, 2011 issue of The New Barker. The article appears below. More photos, taken by Anna Cooke, may be found on The New Barker facebook page. The deadly 9.0 magnitude earthquake that hit Japan in early 2011 grabbed our attention and wouldn’t let go. The devastation and loss, unfathomable to us in a land that was on the other side of the world. And then the devastation hit closer to home in Joplin, Missouri with the deadly tornado just weeks later. Through it all, The New Barker was receiving daily updates from the National Disaster Search Dog Foundation, based in Ojai, California with 76 SDF Search teams stationed across the United States. On call 24/7, search teams were deployed during both disasters. The updates were posted on The New Barker Facebook page, generating the most response to date from anything ever posted there. We recently had the good fortune to meet up with one SDF team out of Tampa. In Trapper’s case, he flunked out of training to become a guide dog through Guide Dogs of America in Sylmar, California. He is an excitable boy, which proved detrimental to completing his full training as a guide dog. He needed some kind of work more fitting to his personality, and SDF looks for dogs with the non- stop drive and personality that Trapper had. Guide dog training requires dogs not to bark, to walk around obstacles and not to climb on anything – the very skills needed to become an SDF dog. Marshia, who is an Engineer Paramedic with the Temple Terrace Fire Department, was paired with Trapper in July 2004. During their first week of training together Marshia witnessed firsthand the dog’s high energy and drive, and that uncanny Labrador Retriever personality. Every night, after returning to their motel room from training, Trapper, a 70 pound dog, would head for the bathtub and stared at Marshia. “I got the feeling he was just waiting for me to turn on the water so he could jump in to play,” said Marshia. Trapper’s puppy raisers had a swimming pool, so he grew up as a pool puppy. One of their first visits to a Florida beach demonstrated Trapper’s other drive: toys. As soon as they arrived at the beach, Trapper spotted a buoy about 75 yards out in the water. Thinking it was a toy, he intently swam for it. “I had to bring him back three times. The final time he actually got to the buoy and had brought it back a good distance towards shore. I had to wrestle it from his jaws. He was having a blast. I was exhausted,” said Marshia, laughing as she recalled the incident. Trapper’s first deployment was Hurricane Katrina in 2005. Deployed to Mississippi as part of the Central Florida Task Fource 4, Trapper’s job was to search residential subdivisions in Pascagoula, Gautier and Biloxi. Marshia described what the areas looked like when they arrived on the scene. “It looked as if a huge explosion had gone off. A cross between a landfill and a lumber mill. Just a river of debris. You couldn’t tell where one house began and another ended. Toys, including pet toys, were scattered everywhere. And even though Trapper is toy-driven, he never lost his focus or became distracted. His job was to find people, alive but trapped in the debris.” They worked 12 hour shifts going into homes and cars that were partially collapsed. Trapper either walked on top of the debris or went directly inside, trying to pick up a scent of life. Search Dog Foundation training teaches the dogs the ability and agility to maneuver over extremely difficult terrain, including unstable, slippery surfaces. The dogs are able to penetrate debris and small spaces more quickly than any human can. The dogs are also trained not to touch any water or food they find at a search site in case of contamination. Because the dogs are so focused while they’re working, their handlers keep a close eye out for injury, overheating or thirst. December 6, 2007 Search and Rescue teams in Florida were called out to assist the Jacksonville Fire Department with a structural collapse. Parts of a six-story parking garage had gone down while under construction. Marshia and Trapper had just returned to Orlando from a Miami search team training session. With their gear still in the car, she, Trapper and her other search dog at the time, Shade headed to Jacksonville to join five other K9 teams. “We assessed the situation and determined what each dog was best suited for: who tunneled best, who wouldn’t jump off the cantilevered floors, whose weight wouldn’t cause a secondary collapse in weakened areas. We divided up into teams, assigned areas to search, and went to work. Before searching, we verified that veterinary treatment was available, should any of the dogs be injured,” explained Marshia. There was rebar every four inches, either broken and protruding, or stretched to its limit, waiting to snap. Walls of cement were dangling over the areas that needed to be searched. Loose four-by-four boards and sheets of plywood were balancing precariously over deep voids. “It was extremely noisy, due to the cranes removing debris and generators operating tools and lights. At one point, they needed to call for “all quiet” when the K-9’s were on the pile in order for us to hear them alert. Everyone stopped and watched hoping to hear one of them bark—an alert that would mean the dogs had found someone alive,” said Marshia. At one point, Marshia said that Trapper, choosing his own route as always, stepped off a ladder onto a piece of plywood. As it slid all the way back down to the bottom of the pile, he rode it like it was the teeter totter he trains on. “He just waited until it stopped, looked up and got back on the ladder and climbed up again,” said Marshia. Trapper is a search and rescue dog, trained to find people who are alive. For example, if 20 people are missing in the rubble of a disaster site, and three are alive, Trapper will only alert by barking in those three places. If the dogs don’t alert, then cadaver dogs are brought in to search and recover the dead. The searches at the Jacksonville site were held around the clock for two days, with the fire department doing selective breaching and debris removal. Although the dogs showed interest in some areas, they did not alert. This can be discouraging and depressing at times for the dogs. So, in the dark of night, volunteers hid, allowing the dogs to be rewarded for their good work after finding them. “This gave them the incentive to go out and search the following day,” Marshia continued. Soon, two dogs that search for cadavers were brought up to the area and immediately alerted. Rescue workers carried out the body nearly 60 hours after the building collapsed. Despite the outcome, the teams are always at the ready for the next call. How Was the Foundation Formed? April 19, 1995 At 9:03 a.m., just after parents dropped their children off at day-care at the Murrah Federal Building in downtown Oklahoma City, the unthinkable happened. A massive bomb inside a rental truck exploded, blowing half of the nine-story building into oblivion. A stunned nation watched as the bodies of men, women, and children were pulled from the rubble for nearly two weeks. When the smoke cleared and the exhausted rescue workers packed up and left, 168 people were dead. Eleven FEMA Task Forces were deployed to the disaster—the largest number used at a single disaster in U.S. history. Among the canine search teams was Wilma Melville, a retired teacher, and Murphy, her Black Lab. 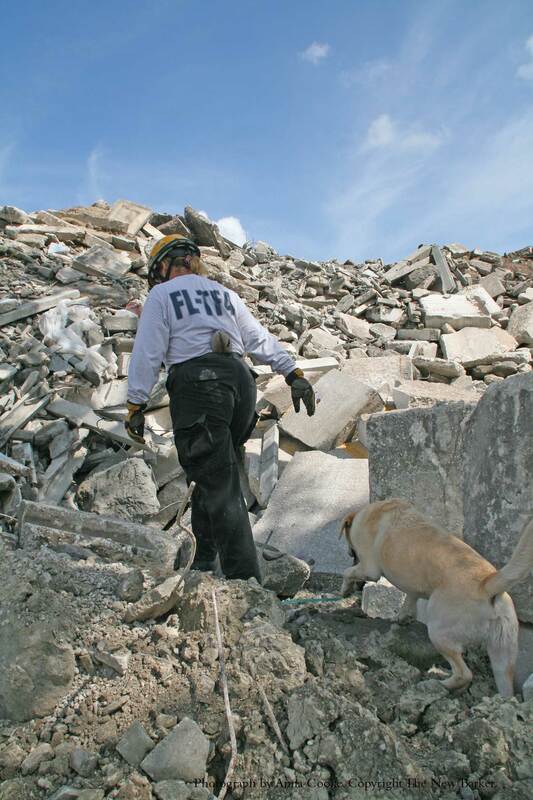 Murphy and the other search dogs were able to cover large areas of rubble, saving precious time for firefighters by indicating where victims were buried. In 1995, there were only 15 FEMA Advanced Certified disaster search dog-handler teams in the entire United States. Recognizing the critical need for more advanced teams, Wilma founded the National Disaster Search Dog Foundation as a way to train teams in a better, more cost-efficient manner. How You Can Help People across America are becoming “Part of the Search” by helping a dog, once abused and/or abandoned, enter the ranks of the most highly trained search dogs in the nation. Individuals, families, schools and companies are sponsoring an SDF Search Dog. Sponsors get to know the dog and handler; follow their training and progress toward FEMA Certification, and disaster deployments. For more information, contact Celeste at 888.459.4376, extension 101. http://www.SearchDogFoundation.org. The World is Watching Florida, Again. No, it’s not because VP candidate Rep. Paul Ryan will address Medicare reforms in Florida this weekend. Nor is it because Tampa Bay is hosting the upcoming Republican National Convention. The eyes of dog lovers everywhere will be focused on Miami-Dade County as residents there go to the polls today to decide whether or not to lift a 23-year ban on Pit Bulls and Pit Bull mixes. In Miami-Dade County, owning American Pit Bull Terriers, American Staffordshire Terriers, Staffordshire Bull Terriers or any dog “substantially conforming” to any of the checklist of characteristics has been illegal since 1989. A dog in the county shelter that is identified as meeting these characteristics – even if there is no DNA proof of “Pit Bull” genes – is only eligible for adoption outside Miami-Dade county boundaries. If the dog is not adopted, it is euthanized, regardless of whether it has any bite history at all. This means that any Pit Bull or Pit Bull mix that winds up in the county shelter, even the most gentle family pet, faces almost certain death. Breed and animal welfare advocates see the law as discrimination and are asking voters to overturn it. 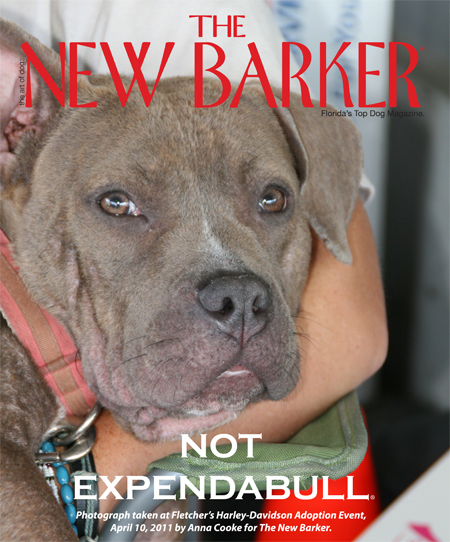 “You better believe this has a chilling affect on anyone who has a dog as part of their family, no matter the breed,” Dahlia Canes, Director and Founder for the Miami Coalition Against Breed Specific Legislation recently told The New Barker. To prove her point, click here for a list of breeds banned in other communities across the United States. Be sure to scroll down to see the list. Many dog lovers and baseball fans who live in Florida, especially Miami-Dade are already familiar with Miami Marlins pitcher Mark Buehrle and his wife Jamie whose dog, Slater quickly became the face of the movement earlier this year. After Buehrle signed with the Marlins, the family had to find a home outside of Miami-Dade in order to keep Slater. The campaign to get out the vote to repeal the antiquated law has been a massive grassroots effort. In addition to the support from the Buehrle family, hundreds of rescue groups worldwide have been supportive. The South Florida Veterinary Medical Association supports repealing the ban, as does the Miami Herald. We look forward to hearing some good news later today from Dahlia. Send your thoughts and support via this blog to the volunteers of the Coalition who are also working the polls today. Author Anna CookePosted on August 14, 2012 August 14, 2012 Categories "The New Barker dog magazine", Dogs, Florida Dogs, Florida's top dog lifestyle magazine., The_New_Barker_Dog_Magazine, UncategorizedTags Dahlia Canes, Dog, Dogs, Florida, Florida Dog Magazine, Jamie Buehrle, lifestyle, Mark Buehrle, Pit Bull, Slater Buehrle, Tampa Bay, The New Barker, The_New_Barker, Vote1 Comment on The World is Watching Florida, Again. Redemption for Shelter Animals in Hillsborough County, Florida. It was a veritable who’s who of Tampa Bay dignitaries and dog lovers at the Westshore Marriott on Saturday, February 4. More than 250 folks attended the Save 90 Conference, featuring Nathan Winograd. 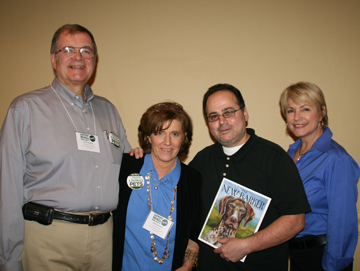 The New Barker, a proponent of the No Kill Movement, and one of the sponsors of the event, first featured a review of Nathan’s book, Redemption, in 2008. It was the book that started the No Kill Movement. Meeting the (in my humble opinion) rock star who is Nathan Winograd was indeed a pleasure, and an honor. 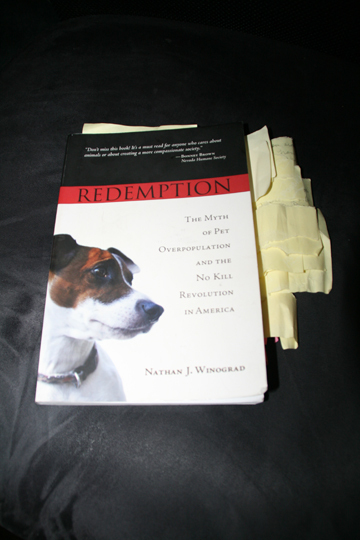 Anna Cooke's well-worn copy of the book, Redemption by Nathan Winograd, autographed by the author on February 4, 2012. He was in town at the invitation of Linda Hamilton and Frank Hamilton, both with Animal Coalition of Tampa, a low cost spay/neuter clinic in Tampa. Pacing the floor before the conference, getting in the zone, it was clear Nathan was on a mission. You see, Hillsborough County Animal Services is searching for a new director, and the Hamiltons are hopeful that the timing of Winograd’s visit will effect the selection process to the degree that no-kill advocacy is a requisite qualification for the job. Animal Coalition of Tampa set the playing field: The game plan is Save 90 and their star player would be Nathan Winograd. On Saturday, February 4, it was Nathan’s job to get a solid foothold in the game, landing Save 90 on at least first base. Tough, since it’s safe to say some in the crowd were skeptical. But Nathan has seen his share of naysayers throughout his career. Indeed those past naysayers would be part of his presentation, complete with audio sound bites. Tampa Bay was ready to hear Nathan Winograd. Among the attendees were Rick Medina of Animal Based Charities; Deborah Millman, executive director of Honor Animal Rescue/Sarasota; Pamela Perry, Investigation Manager for Hillsborough County Animal Services; Pat Hose of Dalmatian Rescue Tampa Bay; Bill Gray with Second Chance Boxer Rescue; Eric Emminger with Pit Bull Happenings; Martha Boden, executive officer of SPCA Tampa Bay; Kris Logan-Walker, owner of Fluffy Puppies; photographer Danette Morse and husband Dan; Kathy Walvoord of St. Francis Society Animal Rescue; representatives from No Kill Manatee, Florida Voices for Animals and Animal Network; Laura Fletcher-Taylor of Fletcher Harley-Davidson and Loving Friends Transport; and Cynthia Smoot of Fox-13 News. Linda Hamilton opened the conference with remarks that were both humorous and compelling. Then, via a taped video, Kris Weiskopf, chief of Manatee County Animal Services gave an eye-opening review of their mission and promise to be a No Kill Community by the end of 2012. Kris introduced Nathan, who held the audience’s attention for the next two-and-a-half hours. Did I say held our attention? The man not only held it, he lassoed it; reeling us in, making us laugh, cry, and then had us thinking long and hard about taking chances. Chances that will make a difference to the bottom line. The bottom line of saving money and most important, saving lives. What’s not to like about that? After The New Barker reviewed Nathan’s book, Redemption in 2008, he contacted me and asked if I would like to send autographed copies of his book to shelter directors in Florida. I gave him the name of several shelter directors, and he made sure they knew the autographed books were sent on behalf of The New Barker. Not one shelter director acknowledged receipt of the book. Although, one director did let me know, indirectly via the shelter’s communications director that the book was not well thought of, and would not be read. Almost four years later, all but one of those directors was in the audience on Saturday, February 4 for the conference. Why the change of heart, Cynthia Smoot of Fox-13 News asked me? My answer: The No Kill Movement is a movement whose time has come to Florida. Manatee County Animal Services made the pledge with full support from the County Commissioners. Other Florida counties are contacting Manatee County, wanting to learn how they too can become a No Kill Community. Linda Hamilton has made trips to Manatee County to meet with Kris Weiskopf and his staff. It’s a movement that can no longer be ignored, or ridiculed. The No Kill Movement has reached the masses, and the people are responding. Not everyone applauded Nathan on Saturday, nor did every person stand during several standing ovations. But, his words, statistics, and photographs provided substantial proof that the No Kill Equation works. The majority of the audience was convinced that Hillsborough County should become a No Kill Community. His words did not fall on deaf ears. When Nathan was finished, Rick Reidy, Hillsborough County Commissioner Ken Hagan’s legislative aide, stood up to address the audience on Hagan’s behalf. Reidy told the audience that Hagan would recommend to the Board of County Commissioners that Hillsborough County Animal Services take the necessary steps to become a no kill facility. Animal Coalition of Tampa's Frank and Linda Hamilton; Save 90 guest speaker, Nathan Winograd;Fox-13's Cynthia Smoot. Nathan listened to Reidy and watched the crowd as they jumped to another standing ovation. A smile was barely visible on this thoughtful man’s face. Yes, we’re in the game because of Animal Coalition of Tampa and Manatee County Animal Services. And, yes Nathan Winograd got us on base. But we’re not in the home stretch yet. The community must get behind this, and let the county commissioners know how important the issue of No Kill is to them. Join the Alliance to Save 90 by going to www.save90.org. Attend the monthly meetings, held the first Tuesday of each month; the first one on February 7 at the Tampa Tribune Auditorium. Make sure elected officials embrace the decision by the community that the killing of companion animals housed in shelters and animal services, is not okay. Make sure elected officials hire a compassionate and competent individual at Hillsborough County Animal Services to lead the plan. The new hire must be able to embrace the No Kill Equation. 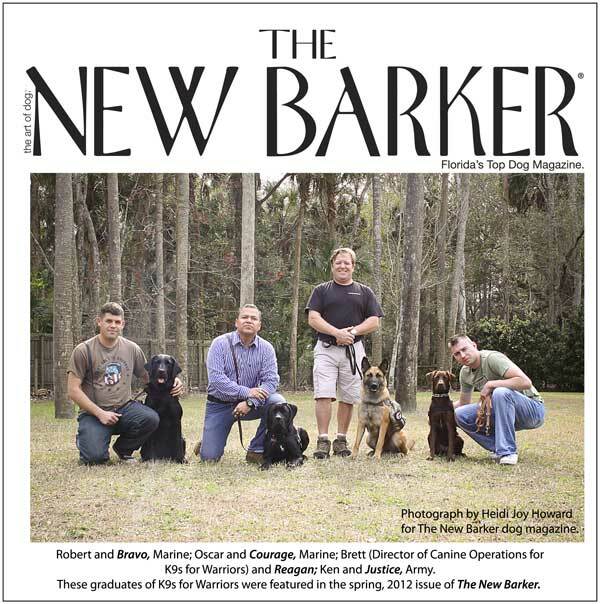 Author Anna CookePosted on February 7, 2012 Categories Dogs, Florida DogsTags Dog, Dog Magazine, Dogs, Florida, Hillsborough, Manatee County, Nathan Winograd, No-Kill Nation, Tampa, The New Barker, The_New_Barker3 Comments on Redemption for Shelter Animals in Hillsborough County, Florida.